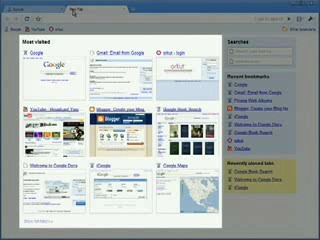 Google Chrome Webkit-based browser might just be the Google OS. The big news of the day? Google announces Google Chrome, a WebKit (yes the very same Webkit that Safari uses) based-browser. As you can see from the example to the right, Google’s browser will have tabs on the top and a speed dial front page like Opera. The real question is how is Google going to use the browser? Will they optimize their sites to take advantage of Chrome (a la Microsoft). Will the planned Gears integration overshadow the support that Google gives to Firefox and recently "Geared" Safari? It now works on Windows but will be released for all platforms (Mac of course) including Linux. All of those little Linux-based EEE type NetBooks will be prime targets for the browser. As the browser becomes more and more important and more applications go online, the browser will begin to be everything. Gears is be best example of the browser going offline. At the moment you can take your Reader, Docs and Spreadsheets offline. Soon Gmail and many of Google’s other applications will work offline and on. Overall, as Google Apps/Mac users, this is great news for us. Hopefully Apple and Google can work together to make Webkit better across many platforms.